Bitnami Cloud Hosting creates temporary IAM users to perform different operations. Therefore, it is important to ensure that your AWS IAM identity has enough permissions to add these temporary users. Click your name in the top right corner and then, in the resulting sub-menu, click the “My Account” link. On the resulting page, note your Amazon Account Id. NOTE: Your Amazon Account Id is different from your Amazon Account Number. Your Amazon Account Id is a single number without hyphen. Click the “Services” link in the top left corner and from the resulting list, select the IAM service. Navigate to the “Policies” section in the left navigation bar and click the “Get Started” button. Click the “Create Policy” button and then select the “Create Your Own Policy” option. Set the name for the policy to “BitnamiCloudHosting” and add the policy document shown below, replacing the ACCOUNT_ID placeholder with your Amazon Account ID. The message “BitnamiCloudHosting has been created. Now you are ready to attach your policy to users, groups, and roles.” will be displayed if the policy was created successfully. Navigate to the “Users” section and click the “Add user” button. On the “Details” page, enter a user name for use with Bitnami. Ensure that the “Programmatic access” checkbox in the “Select AWS access type” section is selected. Click the “Next: Permissions” button to proceed. On the “Permissions” page, select the option to “Attach existing policies directly”. 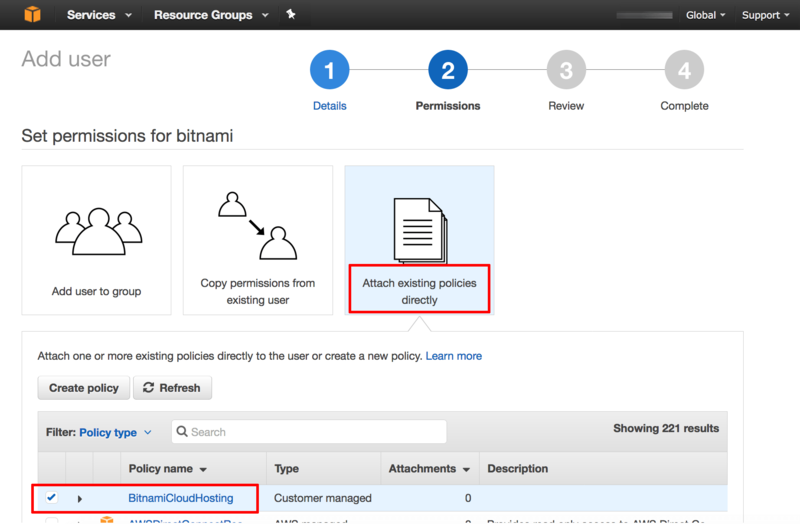 From the list of policies, find the new “BitnamiCloudHosting” policy. Select it and click the “Next: Review” button. On the “Review” page, review the selected options and click the “Create user” button. A new user and corresponding key pair, consisting of an “Access Key ID” and “Secret Access Key”, will be generated and displayed. The “Secret Access Key” value will not be displayed again, so it is important to accurately note down the “Access Key ID” and “Secret Access Key” values displayed on the screen at this point. 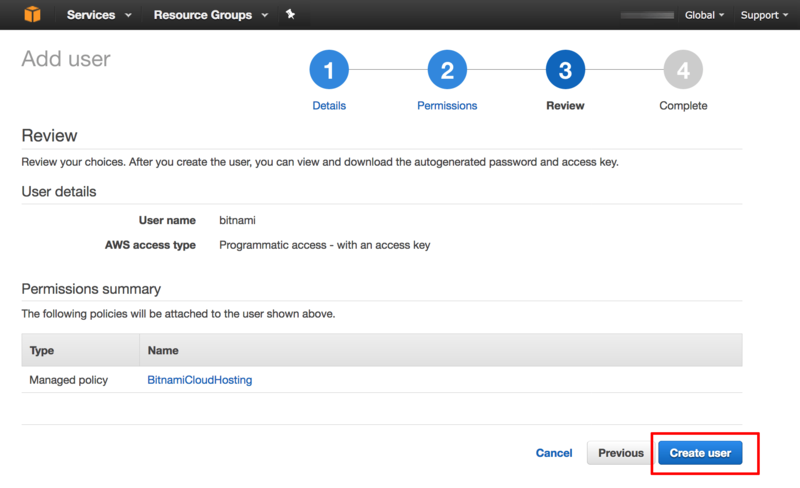 The “Access Key ID” and “Secret Access Key” can now be used to create the cloud account in the Bitnami Cloud Hosting dashboard.